(Al Hartmann | Tribune file photo) Chad Smith, of West Valley City, looks at redistricting maps on Sept. 27, 2011. By a 2-to-1 margin, Utahns support Proposition 4 to create an independent commission to redraw the state’s political boundaries in its once-every-decade redistricting, a new poll shows. Even a plurality of Republicans support it, although Democrats charged for decades that big-majority GOP legislators unfairly gerrymandered boundaries here — and Prop 4 grew largely out of that. “It’s those Ronald Reagan ads they are running,” said Utah Senate Majority Leader Ralph Okerlund, R-Monroe, a Prop 4 opponent. Supporters’ ads show a video of the late president pushing for independent, bipartisan redistricting commissions to combat “un-American” gerrymandering. “That has a lot of Utah Republicans thinking they are supporting something that is Republican,” Okerlund said. But he contends Prop 4 aims to help Democrats create a safe Democratic congressional district in Salt Lake County and give unelected officials who are not beholden to voters control of drawing districts. Steve Griffin | The Salt Lake Tribune Senate Majority Leader Ralph Okerlund, R-Monroe, answers a question about tax legislation during media availability at the Utah Capitol in Salt Lake City, Friday, March 3, 2017. A new poll by the University of Utah’s Hinckley Institute of Politics for The Salt Lake Tribune shows likely Utah voters favor Prop 4 by a 58 percent to 22 percent margin, with 20 percent undecided. That is up from a June poll, which showed a 50-28 percent margin with 23 percent undecided. Republicans now favor Prop 4 by a 48-27 percent plurality, while Democrats favor it by a 76-10 spread and unaffiliated voters give it a 63-21 margin. Supporters have raised big money to put Prop 4 on the ballot and campaign for it — while no organized groups are running ads against it. 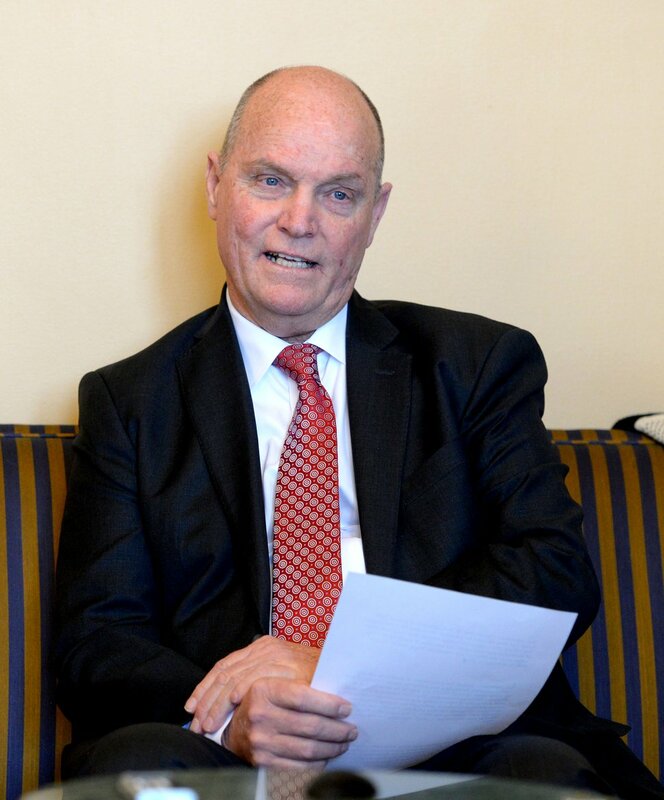 Utahns for Responsive Government, a political issues committee for supporters, raised $1.46 million this year, with 67 percent of the group’s money coming from out of state. Jeff Wright, co-chairman of the Better Boundaries group that gathered signatures to put it on the ballot, is a former GOP congressional candidate. Ralph Becker, a Democrat who was two-term mayor of Salt Lake City and a state legislator, is the other co-chairman. Steve Griffin | The Salt Lake Tribune Former Salt Lake City Mayor Ralph Becker, right, and Jeff Wright talk about the formal launch of the Better Boundaries initiative, which will ask voters to create an independent commission to redraw political districts. 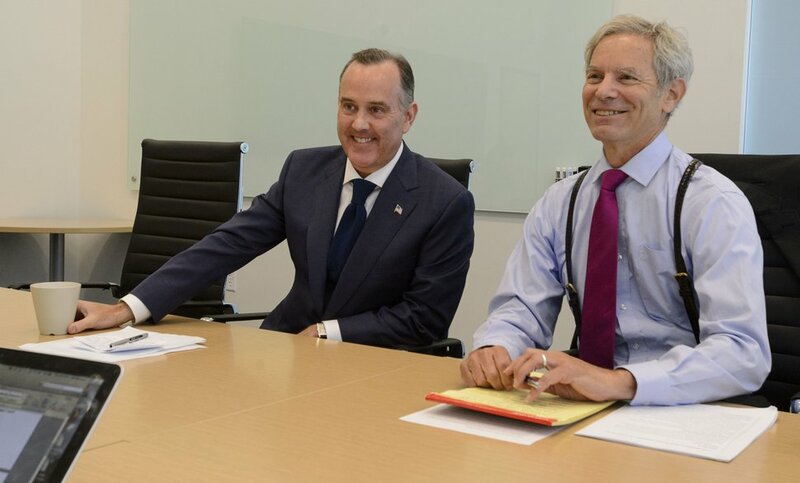 The pair spoke from the Cicero Group offices in Salt Lake City Thursday, July 20, 2017. The proposed commission would be appointed by the governor and legislative leaders, and at least two of its members must be politically unaffiliated. The Legislature could reject any plan proposed by the commission and adopt its own, but would need to outline why — and that could become problematic with voters. But the GOP was criticized for holding much of its debate on maps behind closed doors. He also says gerrymandering is in the eye of the beholder. “Every map that isn’t drawn by me is gerrymandering,” he joked, but said many groups actually feel that way. Prop 4 comes amid persistent allegations of gerrymandering, including the last time the state redrew boundaries after the 2010 Census — including charges that Democratic areas in Salt Lake County were diced and sliced to dilute that party’s power. Then-Democratic U.S. Rep. Jim Matheson accused GOP legislators of splitting up his old district three ways to make re-election impossible in the district where he lived — so he chose to run in an adjacent one that included more of his old constituents. With the unusual move, Matheson barely won re-election — by 768 votes — over GOP challenger Mia Love in 2012. Two years later, he chose not to seek re-election, and Love won the seat. Now Utah’s all-Republican U.S. House delegation has no member from Salt Lake County, the state’s most populous. Last year, a nationwide Associated Press analysis said Utah Republicans won an average of 64 percent of votes in each legislative district, but gained 83 percent of the seats. It concluded Utah Republicans won three more seats than they likely would have had districts been drawn more objectively. The new poll was conducted Oct. 3-9 and surveyed 607 likely voters. Its margin of error is plus or minus 4 percentage points.